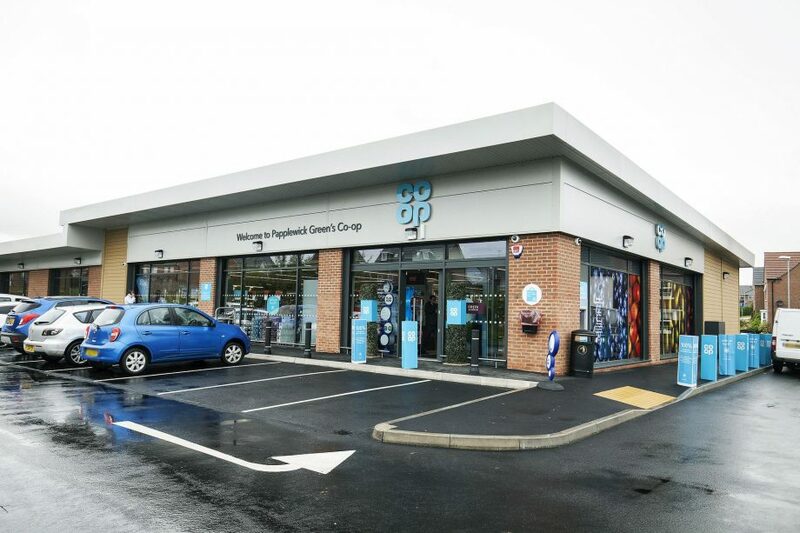 The proposal was for a new Co-op Retail Unit that was the main part of a neighbourhood scheme that also included a Barnado’s unit, a fast food unit and the tenant of Unit D was to be decided later. The works also included staff and customer parking, disabled bays, an uncontrolled crossing point and a combined customer / servicing access arrangement. The Section 278 works had to accommodate two access points and the opposing residential site access, therefore Enzygo proposed an extended raised plateau that assisted in reducing vehicular approach speeds, although the highway drainage had to be revised. Pedestrian connectivity was also key as the store was located on the edge of large residential development scheme and its convenient location generated a high number of non-car trips as school children and families walked to the store. 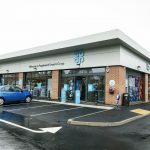 This assisted in providing a sustainable store with reduced parking that also enabled Enzygo to use more of the site area for servicing, etc. Enzygo were responsible for ensuring the section 278 Agreement works were undertaken in accordance with NCC design requirements to obtain technical approval from NCC. The design works were not straight forward and Enzygo had a number of design issues to incorporate into the design that included third party land constraints, services and visibility issues. The innovative access solution provided by Enzygo, in conjunction with the Section 278 Agreement works saved the client significant construction costs and through the provision of a Traffic Management Plan, also undertaken by Enzygo, the scheme progressed through the planning stages. The existing road levels and finished floor levels also provided a design challenge for Enzygo that was solved by provided an extension of the raised plateau not only along Papplewick Lane bus also partly into the site. This ensured that the large articulate HGV’s that delivered to the Co-op store were not at risk of turning over as the proposed levels ensured the super elevation gradients confirmed to the NCC design standards. 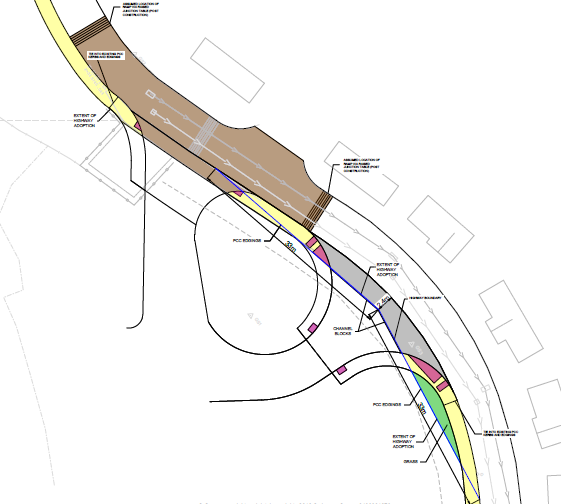 The main challenge on the Hucknall site was to try minimise the areas of full depth pavement construction that were required within the site curtilage. As NCC Highways insisted that the large delivery vehicles had to be segregated from the customers, and their vehicles, they requested turning the large vehicles on the site. This potentially resulted in large areas of full depth construction that was very expensive to provide for the client and it made the scheme unviable. Enzygo designed a ‘teardrop’ access arrangement at the east part of the site that provided the required segregation NCC requested, significantly reduced the full depth pavement construction costs and provided a safe option for all users. The access design allowed all modes of transport to merge in a safe manner with strategically located pedestrian crossings, maximised visibility splays and segregated servicing and customer journeys. The splays, shown on the layout on the left, demonstrate how the extended raised plateau provides a safe access as well as controlling approach speeds. 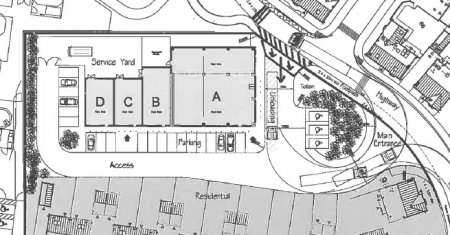 This was an important factor as the site is located to the immediate south of primary school that is subject to high levels of footfall on a frequent basis. The final design was accepted by NCC and Enzygo assisted the contractor through the on-site work curing the construction process. Newcrest Developments were also pleased that all the highway issues had been resolved and the development obtained planning permission. Enzygo demonstrated that by providing an innovative access solution by thinking outside the box there is always an answer. Enzygo has continued to work closely with Newcrest Developments and have assisted on other civil engineering at Bourne and Ebbsfleet. We hope to build upon the expertise and experience we have gained to take forward similar developments across the country and assist Newcrest Developments and other developers at every opportunity.